Whether in motion or parked under the sun in a crowded lot, the 2017 Toyota Avalon’s confident stance and sophisticated design ensure that it will draw a few stares. And it’s not just because of the sculpted lines or the muscular haunches, as the distinctive LED headlights, the chrome-accented front grille, and the dark gray 18-inch alloy wheels all contribute as well. In fact, just about everything about the Avalon’s exterior makes it a treat to look at. French stitching, soft-touch materials, and leather-trimmed seats come standard in the 2017 Toyota Avalon, which work in concert to create an unforgettable driving experience every time you go somewhere. This is further enhanced by the meticulous craftsmanship, the soundproof cabin, and the various subtle design touches and attention to detail all throughout, not to mention the spacious second row and various standard and available luxury features. The Avalon is a car that feels tailored just for you. 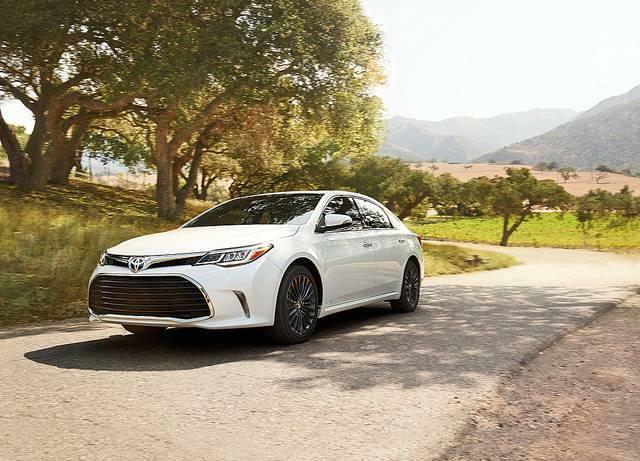 If regular fuel economy figures just don’t cut it for you, there’s always the 2017 Toyota Avalon Hybrid, which uses Toyota’s famous Hybrid Synergy Drive® system and an electronically-controlled CVT (Continuously Variable Transmission) to boost the Avalon’s fuel economy up to 40 mpg in the city and 39 mpg on the highway. Meanwhile, the multi-information display makes it easy to track all your stats by showing everything you need related to mileage.